I really love this Impression Obsession image - Sweet Lemonade. It's so summery, fruity, lovey dovey, and PERFECT for these 3 challenges! So I got to work stamping it with Memento Tuxedo Black and coloring it with Copics. I cut it out with Nesties and mounted it on black and Melon Mambo. Not much more was needed with this combination, so I just decided to emboss white card stock with PTI's Sunshine Impression Plate for the base of my card. I tried all kinds of placements for the sentiment, which is from Wilson Designs' Teeny Bikini. Nothing looked right. This image really stands on its own, so I took the plunge and stamped it right on the image panel. I am so glad I did that. My eye was pleased! I need a glass on lemonade now... Thank you for visiting my blog! I always appreciate your wonderful comments. Do you know how much of a craving I have for lemonade right now? Your beautiful, vibrant coloring speaks of summer refreshment! I love the simple white background with the swirly texture - just delightful! Gorgeous summer card and I agree that it is perfect for those challenges. Good luck! Very summery Stephanie....is it not alcoholic at all??? Looks like a long cool one! Hi there -great CAS make - love the vibrant colours & that little pink brolli just brings it all to life - great job! 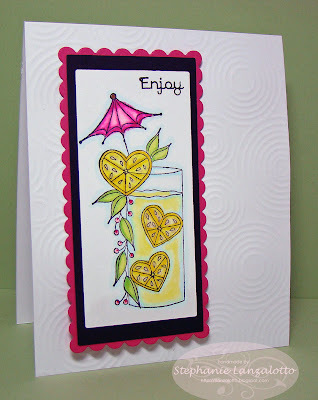 Thanks for joining us at Card-Makin' Mamas, we have another challenge starting today for a special Birthday Celebration with Tickled Pink stamps, hope you can join us, the sporsers images are absoultely gorgeous! Stephanie, this is too, too cute! LOVE the heart shaped "lemons"....perfect for the challenge!! 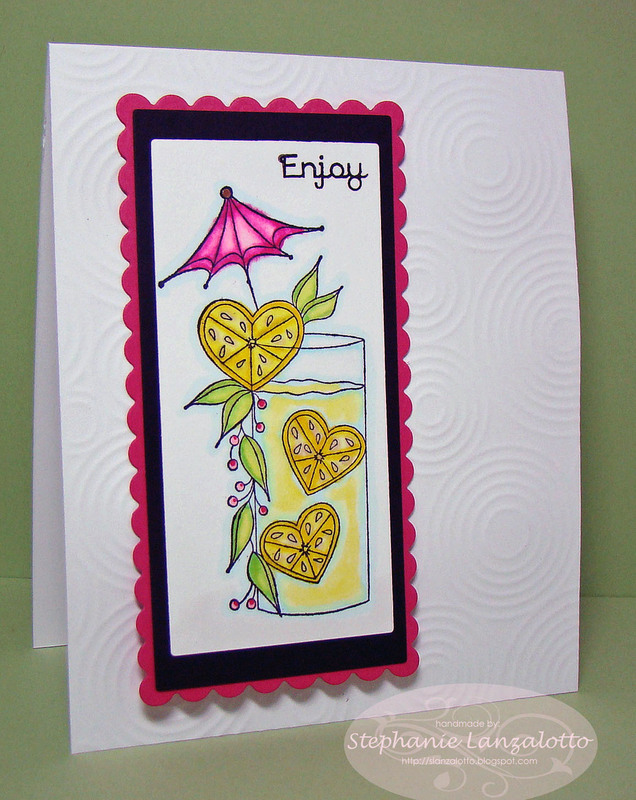 Very summery and refreshing card! Love your coloring!